Dead plants make me sad. Last night, a black and crispy mixture greeted me as I covered up the peppers, tomatoes and basil by headlamp in anticipation of yet another cold night. Since last night, I’ve been the kind of gloomy grumpy that lingers through the next day, despite my best efforts to perk myself up. And I’ve tried. I watched a badly produced video on composting and read a homesteading magazine featuring pictures of baby goats and showing me how to make the garden signs I’ve been planning in my head. To no avail. I’m still grouchy. However, I’m hopeful that today’s beautiful weather with sun and a high of 68°F will perk the garden up. When I recheck everything tonight while watering, I’ll be greeted with growth and greenery and some of the black death and crispiness will be gone. At least the peas won’t let me down. Neither will the kale and chard. And the Red Velvet lettuce is doing just fine. On a side note, this morning when I walked into the office, the beautiful hydrangea I received for my birthday was drooping, blue-purple flowers looking wilted and shriveled up. DAMN! Another plant murdered! Can’t I catch a break with even the indoor plants this week?!? After kicking myself for not checking it before I left last night and spewing a string of colorful and descriptive words, I gave it a good drink and hoped that it would go back to its beautiful self before my coworker (the giver) came by to check it out. More sadness. More gloom. More grouchiness. Ugh. Luckily my coworker is out today. And luckily, no plant-a-cide happened. The water worked its magic and it’s just as blue and beautiful as it ever was. Whew. That perked me up a tiny bit. Especially since I know zero about hydrangeas except that they can shift color depending upon the soil. 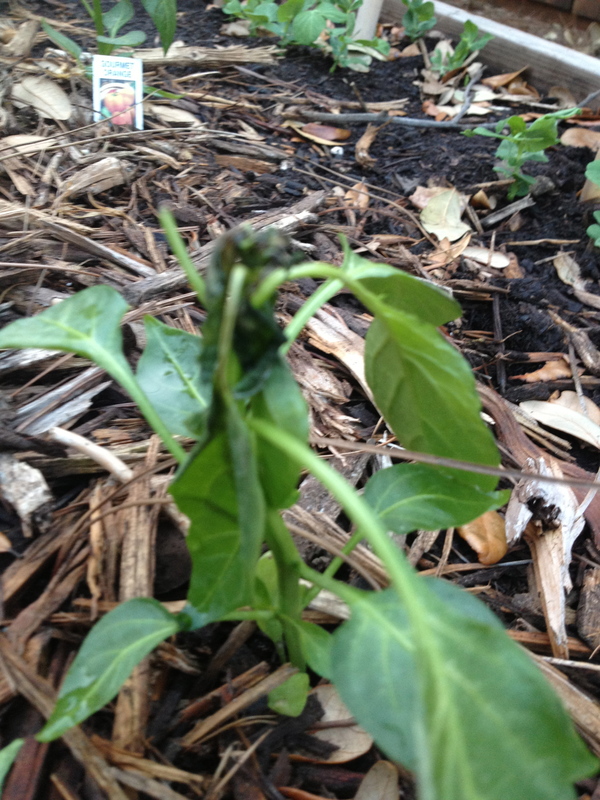 A crispy, wilted green bell pepper. It was sheltered, but I guess it wasn’t warm and sheltered enough. It will need to be replaced. This was one of the bushiest of the tomatoes. 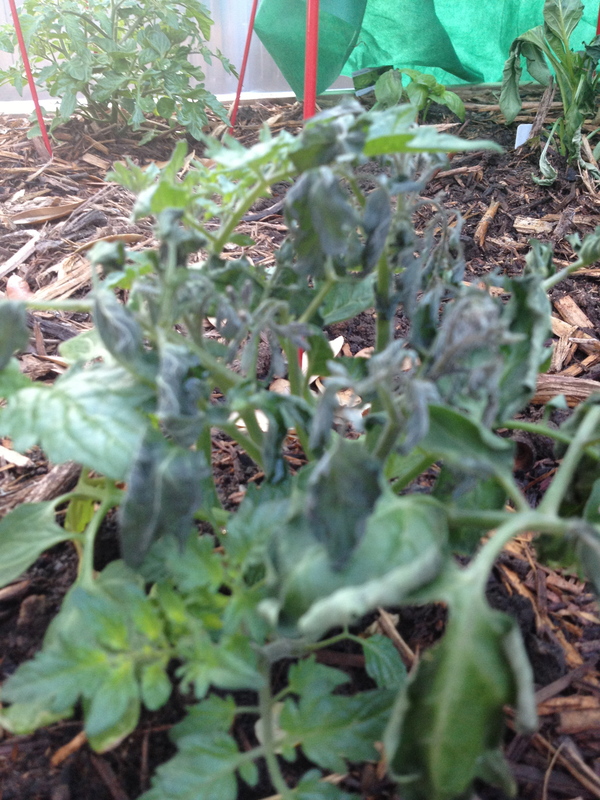 It will need to be replaced since the frost and cold have fried its top and probably stunted its growth for good. 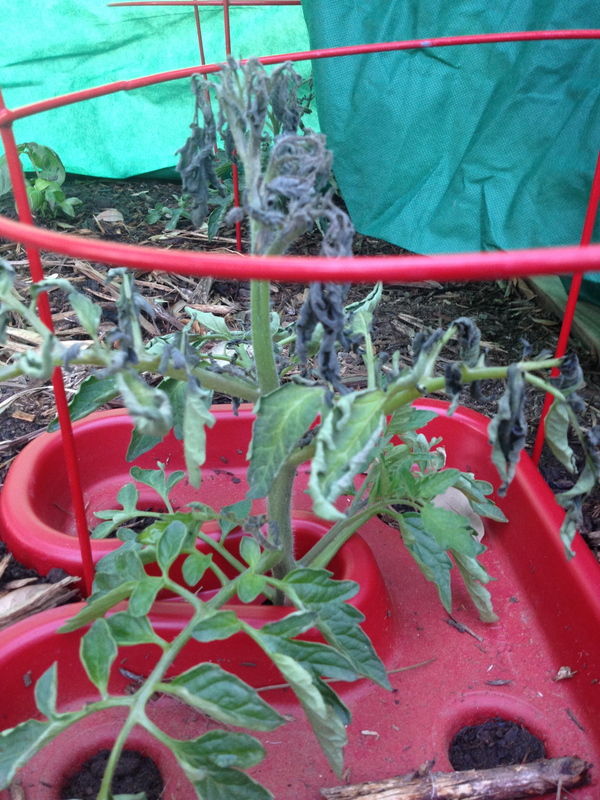 Another tomato plant, fried at its top. This is one I will assess on Friday, especially since it’s part of the red water tray experiment. It was also one of the taller plants. A common crispy leafed tomato (probably one to replace). This one makes me sad because so much of it got damaged. See what I mean? 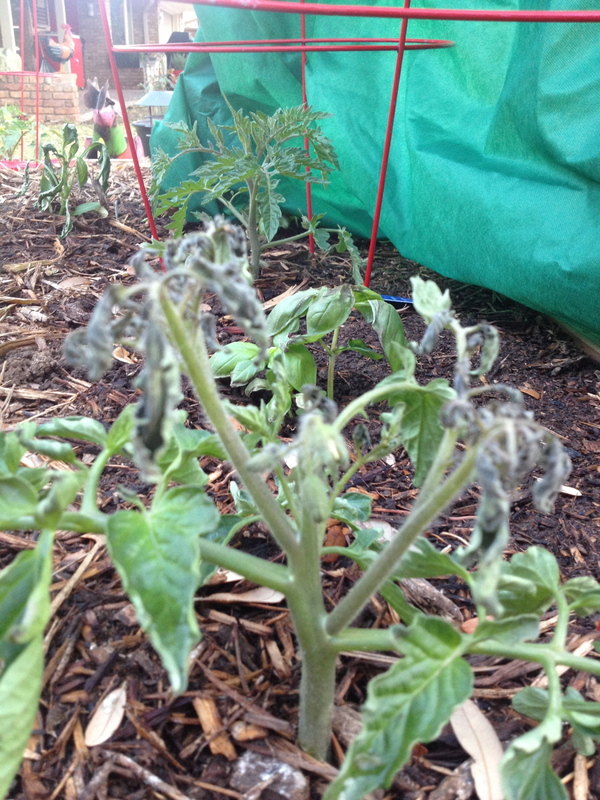 Hopefully this is the end of the frosty and cold nights and we can get back to good tomato growing weather. Don’t let anyone tell you that growing tomatoes in North Texas is easy. I struggled last spring, last fall, and this spring has also been a battle. And if by chance you figure out what I did to entice Old Man Winter to come back for a visit, could you let me know? He is not welcome back in Dallas until at least November. 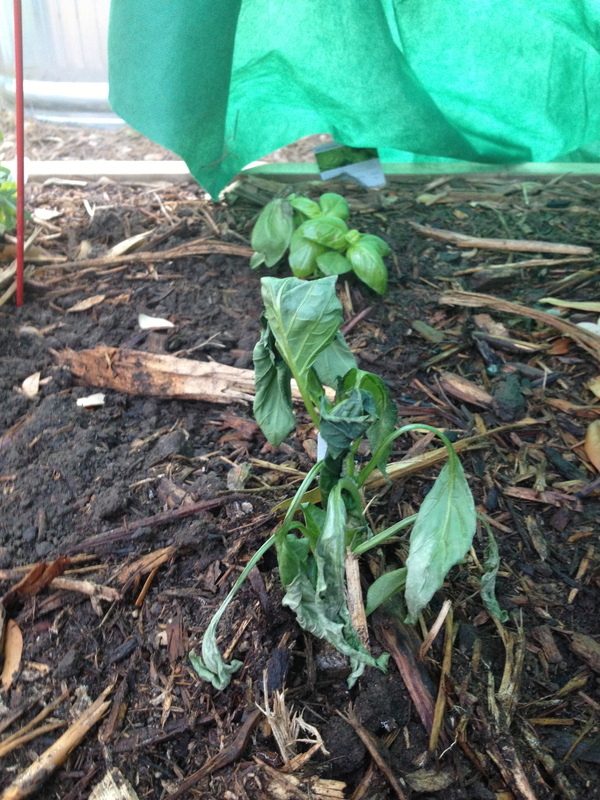 This entry was posted in Sow and tagged basil, cold, frost, garden, gardening, Julie Petroski, Mortroski Midcentury Urban Farm, Old Man Winter, peas, peppers, sow, tomatoes, water, weather. Bookmark the permalink. Ohhhh, what a shame! You need face licks. Where are the Gs? And hugs from Bruce would be good too. I’m sure the Gs will definitely cheer me up with tail wags and licks when I get home–gotta pick up dog food tonight on my way home! Oh they love me right now–I gave them bully sticks! Ohhhh, I can just imagine!! Doggy bliss. And many doggy kisses. Thank you! the ones that don’t will get replanted. Great idea–thanks for the suggestion, Ed.